Orphea is on the PTR now to test and the patch is scheduled to go live next week (11/13 in NA). •Players who queue for Quickmatch games using roles that are in short supply will receive 50% bonus experience for being team players. Just look for the “Call of the Nexus” Bonus Experience indicator located above each Hero when viewing the Hero Selection screen. •NOTE: Call of the Nexus will not be active immediately active, but will be enabled a short time after this patch hits the live servers. •What was once called a Stimpack is now a Boost, and in addition to buffing your own experience and Gold gains at the end of a match, all players will receive 5% bump in experience for each player in their match who had an active Boost. That mean players can receive up to a 45% XP bonus if all 10 players in game have a Boost active! •In addition to stacking Boost XP buffs, you’ll now be able to retroactively Boost your Gold and XP gains at the end of a match by applying a Boost from the Score Screen. •Overflowing Chaos (Trait) •Hitting an enemy Hero with a Basic Ability grants 1 Chaos. Chaos can stack up to 3 times. •While Orphea has Chaos, her Basic Attacks against Heroes consumes all Chaos, dealing 50% increased damage per stack, and healing for 100% of the damage dealt. •Shadow Waltz (Q) •After 0.5 seconds, deal 150 damage to enemies in a line. •Hitting a Hero with Shadow Waltz sets its cooldown to 2 seconds and causes Orphea to dash a short distance upon moving. •Chomp (W) •After 0.6 seconds, deal 285 damage to nearby enemies in front of Orphea. •Dread (E) •Release a wave of dread that deals 85 damage to enemies hit. •Dread erupts 0.75 seconds after reaching the end of its path, dealing 175 damage and Slowing enemies in the area by 25% for 2 seconds. •Eternal Feast (R) •After 1.5 seconds, deal 210 damage in an area. •Eternal Feast repeats every 1 second as long as it hits an enemy Hero. •Crushing Jaws (R) •After 1.25 seconds, pulls enemies in an area towards the center, dealing 275 damage and Stunning them for 0.75 seconds. •Additional space for Heroes has been added to the Hero select screen. •Battlegrounds with mechanics that add additional (default hotkey: F) buttons (Warhead Junction, Snow Brawl, etc.) have had the appearances of their panels unified. •A new “Bundles” page has been added to the Collection tab. •Several new emoji packs, sprays, and portraits have also been added to the game. •Fixed an issue that caused some Shielding and Healing values to track improperly on the score/stats screen. •Fixed an issue allowing some summoned units to grant vision of Heroes inside brush if placed at the edge of the brush. •Fixed an issue causing some spell effects associated with taunt animations to appear after the animation was canceled. •Whitemane: Fixed an issue causing Witch Whitemane’s custom mount animation to cease playing after she died once in a match. •Fixed a number of tooltip issues and inaccuracies across the game. •Kerrigan: Fixed an issue that disabled Health and Mana regeneration during Chrysalis. •Stukov: Fixed an issue preventing Lurking Arm from revealing damaged targets if they were at the edge of its area of effect. •Tyrande: Fixed an issue preventing Elune’s Chosen from healing allies if damage was dealt to Shielded/Protected targets. Rich’s first impressions preferred ptr build for Orphea. 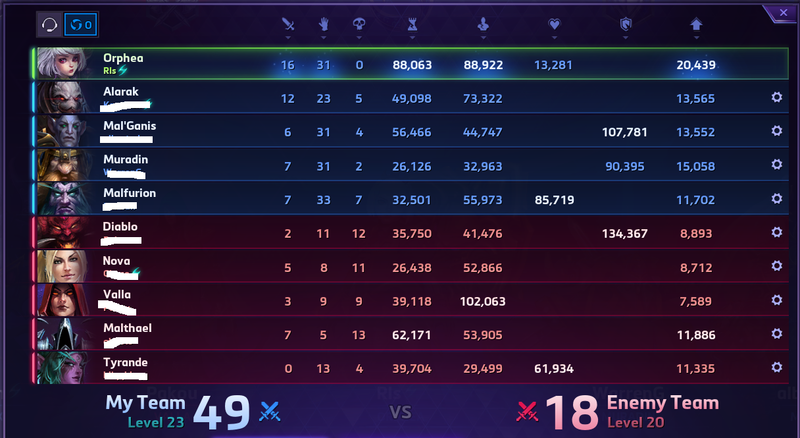 Surprised by the random Q build Gul'Dan buff. I have been playing Q build with GulDan for almost 2 years to GREAT success. It was always a sleeper, much more reliable and consistent than E build, imo. Orphea did see some nerfs from PTR to live, with an increased cool down if you miss a Q, a decrease in how fast the level 7 chomp quest stacks, and a decrease on the stacking spell power on level 20 talent.